That purchase back in Germany sparked a lifelong passion. He graduated from that first Vespa to larger motor bikes and finally to a car in the mid-1990s. At that time, Stefan thought he’d left two wheel vehicles behind him for good… until he came to Australia. Stefan is a mechanical engineer by trade and has always worked in the automotive industry. He started as an apprentice, processing plastic and rubber molds in a German tyre manufacturing company. He was there for 17 years. But in 2010 he decided to come to Australia… and he’s never left. He considers himself lucky to have landed a job with Hella Australia, a company born in Germany in 1899. (What were the chances… a German national finding a job in a German company, in Melbourne Australia?!!) Hella is most famous for manufacturing car headlights. However they’ve now evolved into a global organisation manufacturing all types of vehicle lighting as well as high performance electronics and more… and they also distribute parts for many renowned Original Equipment manufacturers. Stefan quickly worked his way up to the position of Product Manager for one of those O.E.  products – Mann Filters. They’re made by an outfit called… (wait for it)… Mann + Hummell… yep – another company founded in Germany. In this position, Stefan was in charge of product management for key accounts… like Whites Diesels, with whom he formed a sound and friendly relationship that he still maintains even though his role at Hella has now changed somewhat. 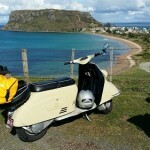 But back to his passion for vintage scooters… soon after arriving in Australia, Stefan happened to come across an online ad. 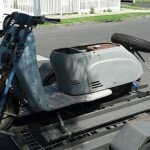 Someone was selling a Vespa Super 150 from 1968. Stefan thought about it for all of a minute before deciding to check it out. It was in good condition and as soon as he heard that typical two stroke engine sound, he fell in love with scooters all over again. He bought that machine and within no time was enrolled as a member of the Vespa Club of Melbourne – a group of like-minded fans who meet regularly and organise rides and other events. He’s now risen to the role of official Club Scrutineer, reviewing bikes and their documentation for registration with VicRoads as Historical or Modified classic motor cycles. And he now owns two Vespas himself – one the requisite vintage of more than 25 years old and so eligible for the Club Permit Scheme allowing him up to 90 days of riding per year – and the other a more recent White Vespa 200cc model with full registration for daily driving. 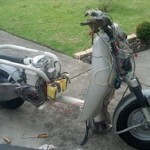 For good measure, two years ago he also bought what he tacitly calls “my German project” – a machine that had been used as a ‘Donor’ to help restore other scooters and therefore didn’t have the original handlebar of the Heinkel Tourist 103 A0. 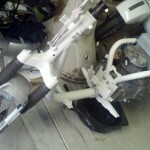 The chrome handlebar and the original speedo and clock from that model are very hard to find these days. Both had been replaced on Stefan’s purchase with components of the ‘later’ 1957 A1 model. 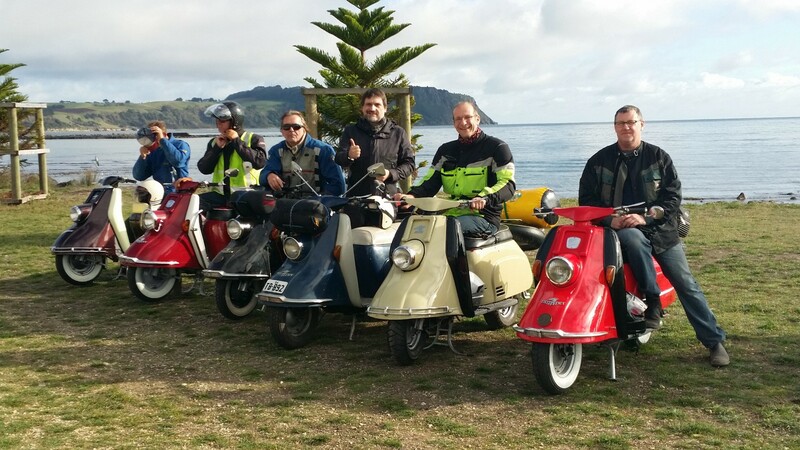 In April this year, less than a month after finishing the restoration, Stefan took his Heinkel on a Tasmanian scooter trip with the Vintage European Scooter Club of Melbourne. 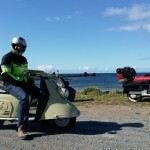 As he tells the story: “I had only done about 200km on the Heinkel when I headed to Port Melbourne to get on board the ferry to Tasmania together with 11 other riders from Melbourne and Adelaide. So, was our scooter-loving mechanical engineer ever a ‘Mod’?